The latest Exchequer returns, released yesterday evening, show total tax receipts were €36.7 billion for the first ten months of the year, 1.7% ahead of target, and 4.7% ahead of the same period in 2015. Overall, the deficit between day-to-day tax and spending continued to narrow, falling from €2.9 billion for the first ten months of 2015 to €1.9 billion for the same period this year. Corporation tax was €177 million ahead of target in October alone, and is now €821 million ahead for the year, more than one-fifth higher than Department of Finance officials had estimated earlier this year. At €4,778 million, corporate tax receipts for the year to date are on a par with the same period in 2015, being only marginally (€30m) ahead. These numbers suggest continued strong profitability in the multinational sector, not least due to the large number of big firms relocating to Ireland for tax reasons in recent years. These are the so-called corporate tax inversions, which not only boost the state’s coffers but make it more difficult to accurately forecast this increasingly important revenue source. While these extra revenues are a boon to the Exchequer, their long-term sustainability is questionable in light of ongoing and future changes to national, European and global tax regimes for corporate profits. VAT receipts continue to climb, increasing by €473 million, or 4.7%, in the year to end-October, while still falling €286m short of the Department of Finance target. At €10,514 million, VAT receipts are the second most important tax heading and are a good indicator of the strength of consumer spending. Excise duties, the other main tax on consumption, are performing even stronger. They are now €224 million, or 4.8%, ahead of target for the year, and €649 million, or 15.2%, higher than during the first 10 months of 2015. Similarly, income tax receipts (including the Universal Social Charge) continue to under-perform slightly against expectations, even as they continue to rise overall. At €14,437 million in the year to end-October, they are €94m behind the Department of Finance target, but still €577m, or 4.2%, ahead of the same period in 2015. Income tax receipts were also €20m ahead of target for the month of October alone, suggesting increased momentum, and continue to represent by far the most important category of tax receipts. Together, income tax and VAT account for more than two-thirds of tax revenues. However, the balance between the two has shifted dramatically in the post-crisis period. 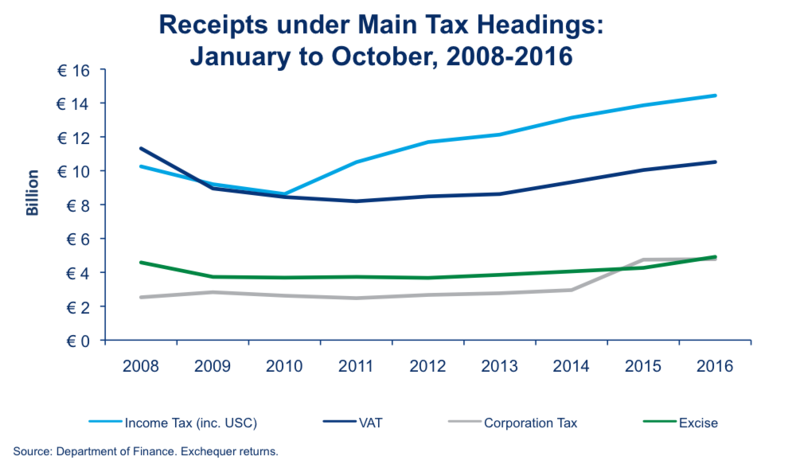 VAT receipts were slightly higher than income tax receipts back in 2008, but since income tax receipts bottomed out at €8,622m in 2010, almost level with VAT receipts that year, they have since surged by two-thirds on the back of large tax hikes and the introduction of the USC. Over the same period, VAT receipts have increased by only a quarter, so that income tax and USC are together now 37.3% higher than VAT receipts. In another notable change, corporation tax brought in a little more than half the income from excise duties back in 2008, but these are now on a par, at €4.8bn and €4.9bn, respectively. In terms of voted – or discretionary – spending, the government spent €508m, or 1.2%, more during the first ten months of 2016 than during the same period in 2015. The bulk of this is accounted for by increased capital spending, which is up 15% on the same point last year, even though it is still 5.2%, or €137m below target by this time of year. Overall, health spending up to end-October was €508m ahead of the same point in 2015, while welfare spending was down by €108m, likely reflecting the continued decline in unemployment. These are by far the two largest areas of public spending. A sixth of the total annual tax take is collected in November. This is the biggest month for corporation tax and income tax, since it is the time of year when many firms and self-employed workers settle their accounts with the Revenue Commissioners. The next set of Exchequer returns, to be published in early December, will be telling as to how healthy the public purse is facing into 2017. Uncertainty surrounding the economic impact of Brexit clouds the picture somewhat, while the government has limited its margin for manoeuvre to respond to any shocks by maxing out the so-called ‘fiscal space’ when it introduced a €1.3bn budget package last month. Separate figures published yesterday by the Central Statistics Office (CSO) show that unemployment continues to fall steadily, down from 7.9% to 7.7% in October alone, around half the peak of 15.2% hit in January 2012. The CSO numbers show that 168,800 were registered as unemployed at end-October, down 4,400 on the previous month, nearly 30,000 less than a year ago, and far from the peak level of nearly 328,000. The youth unemployment rate continues to decline even more rapidly, albeit from higher levels. 15.1% of those aged 15-24 were registered as unemployed at the end of October, down from 15.9% a month previously, and 17% in August. This means youth unemployment is now less than half of the peak of 31.1% reached in July 2012. At 30,500, the overall number of youth unemployed is now at its lowest since December 2006.